The shared library 'libawn' which is used to develop applets which enhance the functionality of AWN. The applets can be coded in either 'C' or 'Python' language. Xgl or AIGLX installed - in short your computer should be capable of compositing support. This mostly means if you have an Nvidia or ATI video card, you should download and install the proprietary drivers. A compositing manager installed. A few examples of compositing managers are Beryl/Compiz/Compiz Fusion, Cairo, Xfce, Metacity, xcompmgr and so on. 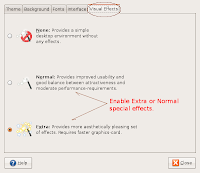 In Ubuntu you can enable compositing manager by clicking System>Preferences> Appearance and then enabling Visual effects from the 'Visual Effects' tab in the Appearance dialog. 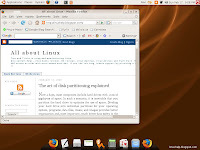 In Ubuntu Gutsy Gibbon, the installation of AWN is a two step process. First you have to enable the backports repository which contain the necessary binaries of avant window navigator and related files. This is done by clicking System>Administration>Software sources on the GNOME panel. It opens the "Software sources" dialog box. awn-manager is a GUI tool which allows you to make changes to the look and feel of the AWN dock as well as install and manage applets and themes. Now that you have installed Avant Window Manager, it is time to take it for a test drive. To start AWN, click GNOME menu Applications>Accessories>Avant Window Navigator. To add applications to the AWN dock, just drag and drop icons from the Applications menu or from Nautilus (/usr/share/applications). You can right click on the AWN dock and select properties to open the 'Avant Window Manager' dialog where you can change the look and feel of the dock and add additional applets. Finally we Linux users have our very own dock similar to the dock seen in Mac OSX Leopard. While the AWN project is still a work in progress, there are a lot of applets available from the ubiquitous clock to the GMail checker which brings visual joy to the user's desktop. To know about these applets, read the following article. Anyone who doesn't have an xgl enabled graphics card (like me for some reason..) can use wbar, it is not as user frindly but very similar (as a dock). Cairo is a composite manager. To be clear, Cairo Compositing Manager is a compositing manager that uses cairo (note the lower case "c") the graphics library for rendering. Non-compositing support for Awn is slated to be added in the next stable version (0.4). Also, calling our "Avant Window Manager" is technically incorrect. We usually just say "awn-manager" or "Awn Manager". Can we use some of your screenshots in our wiki installation guide? In particular, the "Software Sources"-related ones. Thanks for clarifying the finer points. :-). You may freely use them in your wiki installation guide. But do provide a link back to this article from your guide. When you install Awn using the method described above, it installs the "Avant Window Manager" as seen in the GNOME menu which is why I described it as such. Hi, I switched to linux last night (after being a windows user for, at least, 13 or 14 years -since windows 3.11!). I am not familiar with the command line and that's what, as a user, had put me off from switching so far. Well, I finally made the leap. Today, I was trying to figure out how to install Avant Windows Navigator and came across your blog. I just wanted to say THANK YOU! Now you know you helped a total noob in her first steps. Your tutorial was detailed, clear and made my day. This is so cool, but how do i get it to Run on start up? > it to Run on start up? FAQ: How can I make AWN run when my desktop starts up? Can you tell me how to uninstall awn manager? I tried to find for this on internet but they ask to delete awn manager folder from home folder, but there is no folder for awn manager in my home folder.Then I tried the script given but it does not work.